When my mother decided to move out of the Bay Area and spend her retirement years in a “calmer” area, my kids immediately began brainstorming for the perfect going away gift. Over the years, they presented with her with an assortment of handmade trinkets, but they wanted to create something special Grandma could see everyday – a reminder that even though they were far apart, they’d always have each other. I decided to help them make a few different collages through PosterMyWall. A friend had recently introduced me to the site, but I had yet to customize any designs. So I thought, “No time like the present!” The kids and I sorted through a few dozen family photos and selected our faves. Then we browsed through their templates, chose three designs, and started customizing away! Thanks to their easy online tools, we were able to create these collages within minutes. Since we wanted these to be a little more special than the average poster print, we opted to purchase framed prints. 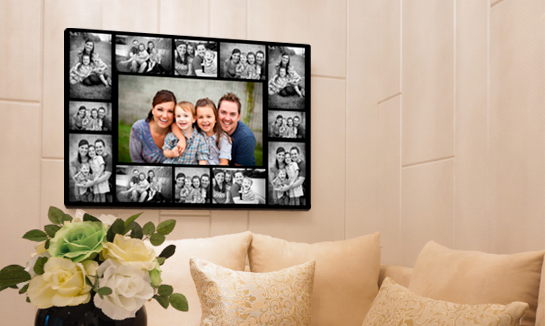 But PosterMyWall offers a variety of print options, as well as download options – and even different shipping options! Check out this page if you want more info on their products and shipping prices. When Grandma opened up her going away gifts, she was speechless. There were a few happy tears, lots of hugs, and plenty of stories behind each picture selected. Thanks for helping us preserve the memories PosterMyWall! Posters – 1/2 OFF Printable Downloads – Create amazing Posters & Flyers in minutes PosterMyWall!